The match was unsettling from the start. Seedorf made another seven changes to the starting eleven vs. Juve on Sunday, and this time it really showed, it was hard to find our form. Playing away to a team desperate to keep their heads clear of the relegation zone, with a wise and experienced tactician in Guidolin, our new found determination got lost a little on the way to Udine. It’s hard to not expect more, even if we were told to be patient. This growing pain business is really starting to hurt. The problem with giving belief back to a fan base who were so beleaguered is that not living up to those expectations is like kicking someone when they are down. And speaking of kicking someone when they are down, we play Atleti again on Tuesday. So we really could have used a good result today to help with our mentality. There’s really not a lot to say about the match. All of the progress we’d made in recent matches seemed muffled at best, and I saw maybe 30 min. total of the pressing and attack that has characterized our last several matches. Udinese’s 3-5-2 system was like the perfect antidote, and they made good work of it, too. With only 35% possession, they were happy to watch us run around and try to hold the ball, then take advantage of our every mistake, which were many. I am not sure if it was fatigue for some of the players like Honda, who played 90 min. in Japan on Wednesday, flew back to Milano Friday, then traveled with the team and played 90 min. against Udinese, but we struggled to find our form, and once we found it, seemed to tire even faster than before. Seedorf’s squad rotation has taken an extreme to the other side, having swapped out seven starters from Juve, six from Sampdoria the week before, and nine from Atletico prior to that, if my memory serves me correctly. What was exciting was watching those first sets of changes play in the same way despite the large numbers of changes in squad. But his luck may have run out today, as this group truly did look like a group of strangers. A very tired group of strangers. Other than the big “L” and not getting any points two matches in a row, the big story for this match was the yellow cards. Sulley “The Killer” Muntari started the parade in on the the 11th minute. But then De Sciglio, who was phenomenal in this match, got one in the 18th, and that will force him to sit vs. Parma next week, a team we could really have used him for. Another surprise was that Mexes earned a yellow in the 51st, but luckily, he hasn’t been playing enough to earn a suspension. Well there was another story… Udinese’s 17 year old keeper, Simone Scuffet. Otherwise, one or more of our five shots on goal (we took 15 total) would have easily found the back of the net, the kid was fantastic. But it was Di Natale’s brilliance after a great team effort outwitting our defense that decided the game in the 67th. 1-0 Udinese. The guy always punishes us. But in the end, it was our sloppiness and fatigue that punished us the most. 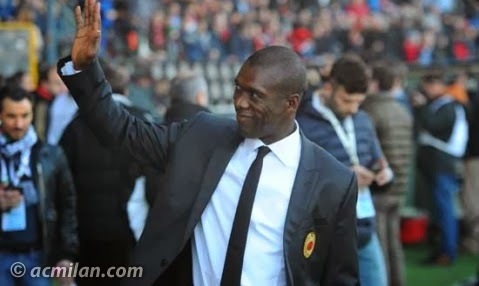 And now we’ve got a precious couple of days to get the mentality and energy back to play the most important game of Seedorf’s coaching career to date. It’s not like all is lost. Today was a bad day. There were things to be learned, like balancing players coming back from injury and International duty with players you want rested for Champions League. I hold Seedorf accountable for that, and I believe he will learn from this. The players can learn that mentality needs to be maintained, as does fitness. And I believe that they will also learn from this, too. I understand Seedorf’s substitutions, but they weren’t enough. I am also not certain of Balotelli and Pazzini playing together, at least not in those positions, as Pazzini had more shots before Balotelli came on, and I also think Balotelli does better alone up front. But it is all a learning process. Sometimes you prepare for a match, you think you have the mentality right and the right lineups, but it doesn’t work out. Especially when you face a team as desperate for points as Udinese. What is important now is to learn from it, to use the loss and the experiences to improve and play better. Which is kind of necessary if we are to do anything against Atleti on Tuesday. Sometimes desperation edges out determination, and today was one of those days.